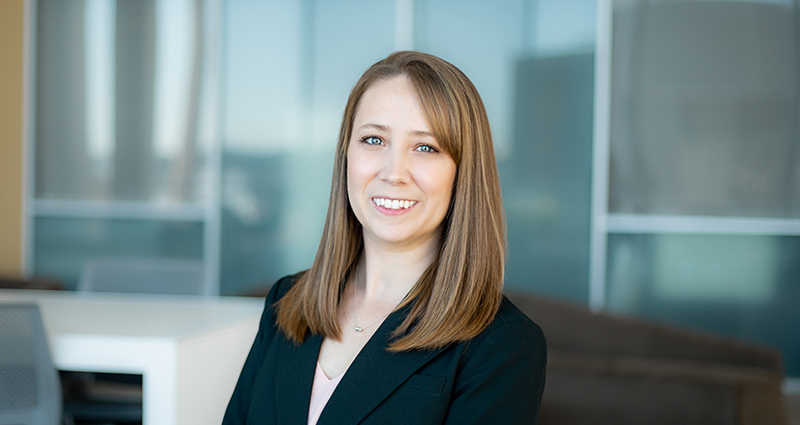 Samantha Page is a Patent Agent with a focus in the fields of polymers and materials science, specifically on matters related to polymer chemistry, polymer composites, nanotechnology, and chemical engineering. Samantha has experience in patent application preparation, as well as both foreign and domestic prosecution. Before joining Cantor Colburn as a patent practitioner, Samantha’s doctoral research in the Polymer Science and Engineering Department at the University of Massachusetts, Amherst focused on developing a new synthetic polymer-based platform for biomedical applications. (8) Page, S.M. ; Parelkar, S.; Gerasimenko, A.; Shin, D.Y. ; Peyton, S.R. ; Emrick T. "Promoting Cell Adhesion on Slippery Phosphorylcholine Hydrogel Surfaces." J. Mater. Chem. B. 2014, 2, 620-624. (7) Page, S.M. ; Martorella, M.; Parelkar, S.; Kosif, I.; Emrick, T. "Disulfide Cross-linked Phosphorylcholine Micelles for Triggered Release of Camptothecin." Mol. Pharmaceutics 2013, 10, 2684-2692. (6) Herrick, W.G. ; Nguyen, T.V. ; Sleiman, M.; McRae, S.; Emrick, T.; Peyton, S.R. "PEG-Phosphorylcholine Hydrogels as Tunable and Versatile Platforms for Mechanobiology." Biomacromolecules 2013, 14, 2294-2304. (5) McRae, S.; Chen, X.; Kratz, K.; Samanta, D.; Henchey, E.; Schneider, S.; Emrick, T. "Pentafluorophenyl Ester-Functionalized Phosphorylcholine Polymers: Preparation of Linear, Two-Arm, and Grafted Polymer-Protein Conjugates." Biomacromolecules 2012, 13, 2099-2109. (4) Chen, X.; McRae, S.; Samanta, D.; Emrick, T. "Polymer-Protein Conjugation in Ionic Liquids." Macromolecules 2010, 43, 6261-6263. (3) Joralemon, M.; McRae, S.; Emrick, T. "PEGylated Polymers for Medicine: from conjugation to self-assembled systems." Chem. Commun. 2010, 46, 1377-1393. (2) Chen, X.; McRae, S.; Parelkar, S.; Emrick, T. "Polymeric Phosphorylcholine- Camptothecin Conjugates Prepared by Controlled Free Radical Polymerization and Click Chemistry." Bioconjugate Chem. 2009, 20, 2331-2341. (1) Samanta, D.; McRae, S.; Cooper, B.; Hu, Y.; Emrick, T. "End Functionalized Phosphorylcholine Methacrylates and Their Use in Protein Conjugation." Biomacromolecules 2008, 19, 2891-2897.